In recent times, Android TV has become a popular entertainment medium for many people. It allows people to choose from a wide range of Android apps and enjoy them on their TV. There are myriads of apps available to choose from. In order to make the most out of your television, it should be backed by a fully functional file manager. There are two reasons behind this move. First, Android TV doesn’t come with an in-built file explorer. Second, because lots of app developers still haven’t made their apps compatible with Android TV, you may need a file explorer to sideload APK files for apps that aren’t available in the Play Store. Let’s take a look at best file managers for Android TV. This file manager app adopts a dual-pane approach to file management. In regard to sideloading, this is truly awesome. The two panes make it easy to move an APK from a USB stick to your Android TV hard drive. You might not find it very user-friendly. Though it is not much complex, it may take some time for you to get accompanied with its functioning. The best thing is that you can even connect to your cloud drivers. To add a cloud drive, navigate to Web Storage > Add Storage in the left-hand panel. It works pretty well with Google Drive, Dropbox, Box, Amazon Cloud Drive, OneDrive, Flickr, and many more. This app is quite popular among Android users and considered one of the best file managers for the mobile version of Android OS. The good thing is that it is found to be work well with Android TV too. The app offers good support for Google Drive, Microsoft OneDrive, and Dropbox. It also offers a built-in media player. While long-term Android users might originally balk at the idea of using a media player that’s part of a file manager, Total Commander’s media player has an excellent feature: it can stream directly from LAN, WebDAV, and cloud plugins, thus killing two birds with one stone. 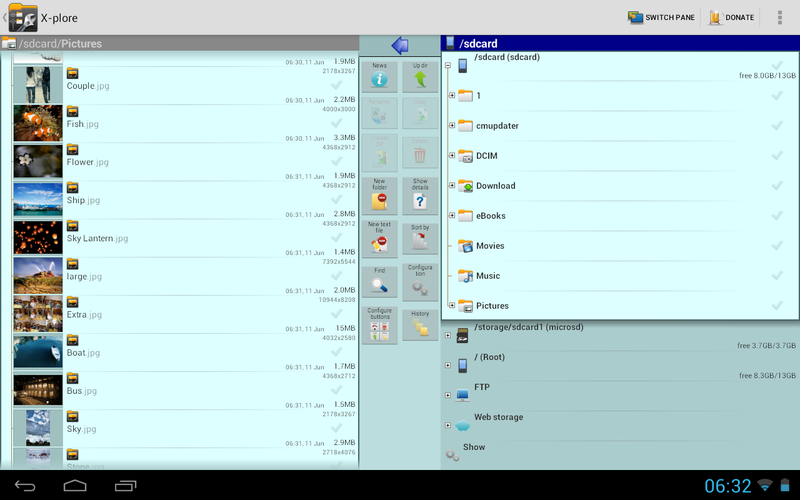 Contrary to X-plore File Manager and Total Commander, TvExplorer is not available on the mobile version of Android. One can only find it via the Play Store on his Android TV device. As it comes exclusively for Android TV, the app sticks to Android TV design guidelines. Given this, TvExplorer has perhaps the most visually-appealing interface out of all the apps on this list. And when you’re looking at an app on a 60-inch screen, that’s a great feature. If you love playing games on your Android TV device, or if you regularly send files over Wi-Fi to watch on your TV, space can arise out as a big concern. Of course, you can expand the capacity by using adoptable storage, but that’s not always hands-on. In such case, AnExplorer File Manager could be the best choice. It’s a very lightweight app that’s been improved for the Android TV interface. It consumes just 3MB on your device. To use your computer as an Android TV file explorer, you need to enable the feature on your device. Go to Settings > Storage and Reset > Storage Access and slide the toggle next to Over local network into the On position. The device will provide you a username and password. Next, on your Windows PC, type \\SHIELD in File Explorer. On Mac, head to Go > Connect to Server and type smb://SHIELD/. Enter your username and password when prompted, and get access to all your device’s files and folders.